Lord Emsworth breathed heavily. He had not supposed that in these degenerate days a family like this existed. The sister copped Angus McAllister on the shin with stones, the brother bit Constance in the leg . . . It was like listening to some grand saga of the exploits of heroes and demigods. A reading list for the Jeeves and Wooster stories. We start with a Blandings reading list, followed by notes on the series. Blandings Castle has joined Narnia, Brideshead and 221B Baker Street as a hallowed setting of English literature. Every enthusiast knows its rose garden, the terraces overlooking the lake, the steps down to the lawn where Gally sips a thoughtful whiskey, the gardens presided over by McAllister, the cottage in the West Wood suitable for concealing diamond necklaces or Berkshire pigs, and the hamlet of Blandings Parva which adjoins the estate. The much loved Blandings series features the absent-minded Lord Emsworth, his prize-winning pig the Empress of Blandings, and a changing cast of relations, staff, guests and imposters. The first Blandings novel Something Fresh, written in 1915, is one of my favourites and a great place to start. Wodehouse continued to write about Blandings for another 60 years (he was working on Sunset at Blandings when he died). The early novels have a different atmosphere to the Blandings that emerges in Blandings Castle, in which Lord Emsworth’s prize-winning pig, the Empress of Blandings is introduced. The volume also includes some fine non-Blandings short stories. The tranquillity of Lord Emsworth’s life at Blandings is constantly under threat throughout the series: from oily villains (like Smooth Lizzie and Eddie Cootes); regrettable relatives (such as Lady Constance Keeble and younger son Freddie Threepwood); supercilious staff (Rupert Baxter); and invited guests (the revolting Duke of Dunstable). At an earlier point in this chronicle, we have compared the aspect of Rupert Baxter, when burning with resentment, to a thunder-cloud, and it is possible that the reader may have formed a mental picture of just an ordinary thunder-cloud, the kind that rumbles a bit but does not really amount to anything very much. It was not this kind of cloud that the secretary resembled now, but one of those which burst over cities in the Tropics, inundating countrysides while thousands flee. Happily for Lord Emsworth, Blandings’ extended cast of heroes and heroines are equal to the challenges presented to them. Lord Emsworth’s younger brother, the Hon. Galahad Threepwood, makes his first appearance in Summer Lightning. He and Uncle Fred (Frederick Twistleton, 5th Earl of Ickenham) put a debonair spring-in-the-step of the later novels, much as Psmith had done in the earlier Leave it to Psmith. The final novel Sunset at Blandings was completed after Wodehouse’s death, from his draft manuscript and notes, by Richard Usborne. I adore the Blandings saga. If you can track down a copy, Lord Emsworth Acts for the Best is a complete collection of all the Blandings short stories (Crime Wave and Girl Friend being my personal favourites. They are terrific! I do love Leave it To Psmith — Say it with flowerpots! I knew there was a short story called Lord Emsworth Acts For the Best, but I haven’t come across the collection by that name. Thanks for the tip. How lovely! Great reference for someone like me. Thank you! Thank you– it’s my pleasure. 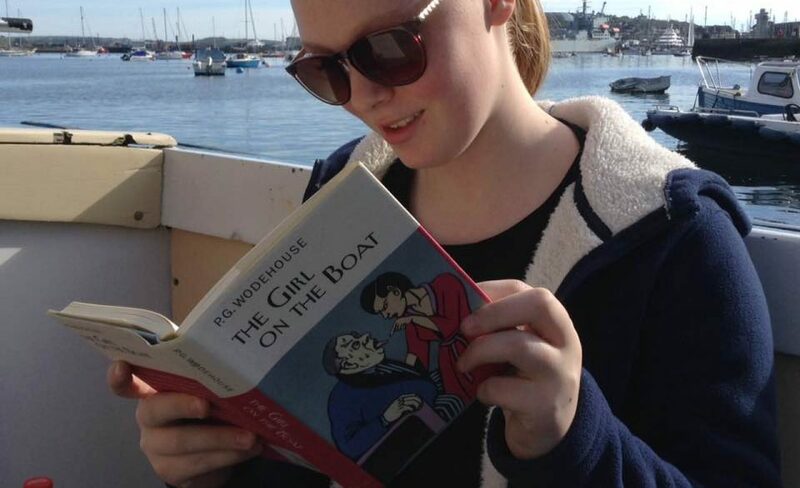 Lord Emsworth and the Girl Friend is my favorite Wodehouse story. It’s such a wonderful story. Read them all, Honoria, proud to say! Only haven’t read the completed version of Sunset, all I have is the one with Wodehouse’s notes edited by Usborne. That’s marvellous. I am planning to reread them in order, one of these days. Crime Wave at Blandings is, imho, the funniest short story of them all. It still makes me laugh out loud!